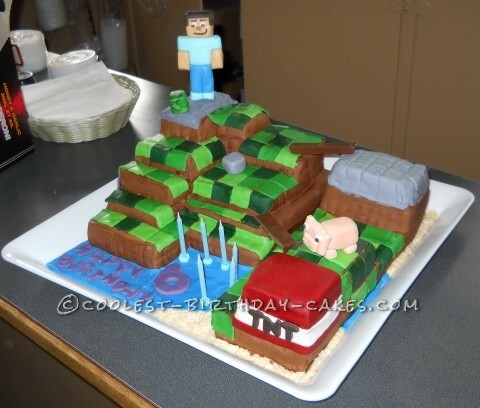 I made this Minecraft inspired cake for my friend’s son for his 6th birthday. I started with 2 9 x 13 cakes but my son poked his finger in one so I re baked it and ended up with 2 1/2 cakes. I cut and stacked 7 layers for the pavilion and stacked 4, 3 and 2 layers in different parts of the other side. This cake was to be enjoyed at two separate parties so thus the two sides. I covered the forms in butter cream and chilled them firm. I then moistened them and covered with chocolate fondant. I used three shades of green to add 1″ squares. I covered the tops of the two highest points in grey and made the TNT block. The last thing I did was to cover the cake plate in blue fondant and rice crispies and added the “happy birthday”. I had made the fondant ‘Steve”, pig and blocks prior and added them at the party along with the candles. The little bridges are Kit Kat bars. Everyone was really happy with the cake except me. I wanted more time to work on it but I was already 15 minutes late for the party. When I saw the birthday boy at the school today, he thanked me again in such a sweet, sincere way. I realized that although I wasn’t happy with it, he totally was, and that is what’s important. Birthday cake idea posted by Jean H.
It looks fantastic! Your cake inspired me to make one for my nephew.